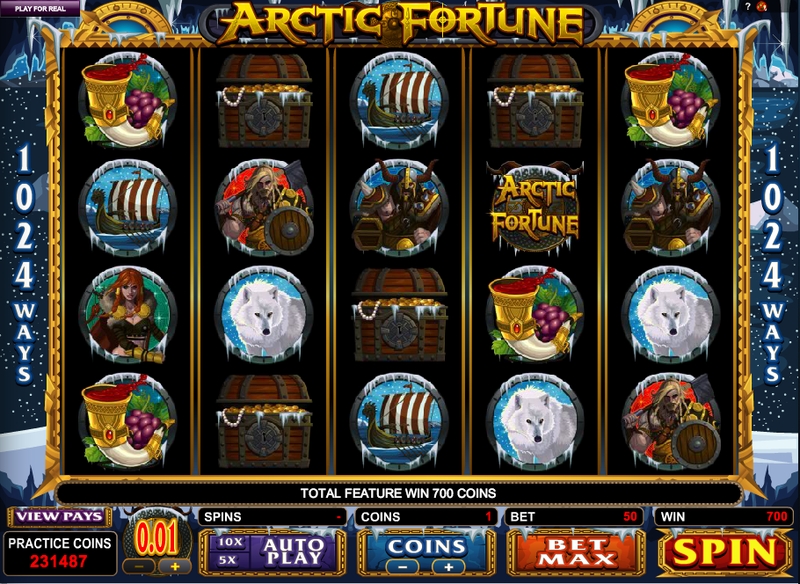 Arctic Fortune features five reels and 1024 ways to win but it also has four rows of symbols which is a refreshing change from the usual three. The reels are set against a background of snow, icicles and icebergs and some of the symbols are of a similar snowy nature. We have a wine-filled horn, a white wolf, a Viking longboat, a treasure chest and three warriors – two make and one female. Bonus symbols are a map scatter and an Arctic Fortune shield wild. This slot features a really entertaining bonus game in which you actually have to interact with the machine to win yourself free spins and coins. First you’ll have to land three or more of the map scatter symbols anywhere on the reels; the next stage is to try and kill giant spiders which your bow and arrow to win yourself free spins, multipliers and coins. A really gigantic spider then stands in your way but he’s easy to despatch too and the free spins will then start. You can see this bonus game in the video below. Microgaming uses this feature in a number of it’s slots and it dispenses with the standard paylines; to make a winning combination all you need to do is land symbols in adjacent rows, starting from the left hand reel. It tends to result in more frequent but smaller wins. A dramatic soundtrack accompanies your gameplay on Arctic Fortune and it’s all great fun; the bonus game is thankfully interactive and the animations on winning combos are of a very high, comic book style quality.